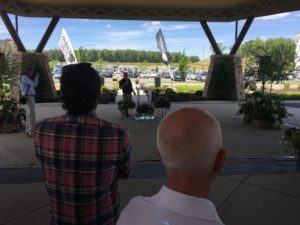 Pocono Manor, PA – More than 100 guests visited Kalahari Resorts and Conventions in Tobyhanna Township on Tuesday afternoon as the resort owners hosted a groundbreaking ceremony for the expansion of its convention center. 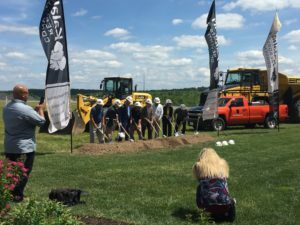 The Pocono resort continues to grow after initially opening several years ago with a massive project that provided Monroe County with Wisconsin-based Kalahari’s first entertainment/recreation destination in Pennsylvania. The resort included an outdoor activity pool, hotel, convention center, spa and salon, golf course, retail shops, full-service restaurants and indoor and outdoor waterparks, and completed an expansion in 2017. Now, the owners will more than double the size of its convention center with an addition that adds 105,000 square feet, bringing the footprint of its meeting and event space to 205,000 square feet. Todd Nelson, owner and president of Kalahari Resorts and Conventions, said his company needed to expand the convention center because of demand. 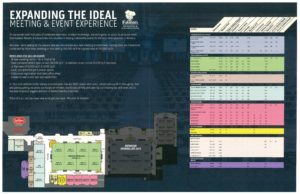 The resort has a strong team in place, all the amenities are already there and guests have the ability to bring their families when attending events, which are all strong draws for people desiring convention center space, Nelson said. “About 40-45 percent of our business comes from the convention center, so it’s a very important part of our business,” Nelson said. The convention center also has been successful because of its good leadership, Nelson said. Construction should finish on the $32 million project in November 2019, he said. Though the features will be slightly different, the expansion will seamlessly connect to the existing convention center, he said. The project includes a 38,000-square-foot ballroom and 18 additional meeting rooms, he said. Additionally, it will have a 12,000-square-foot junior ballroom. Sordoni Construction Services Inc. of Forty Fort will build the expansion. Architectural Design Consultants Inc., based in Wisconsin, is the architect, having been the architect for entire resort.